The Minto Mapping Project began several years ago with the intent of recording indigenous place names of traditional and contemporary land sites used by the people of Interior Alaskas Minto Flats. This collaborative effort was done by the Cultural Heritage and Education Institute, Alaska Rural Systemic Initiative/Alaska Native Knowledge Network, and the Minto High School Students. Support has also been received from the CIRI Foundation Heritage Project Grant Program and the AOL Foundation Interactive Education Initiative. 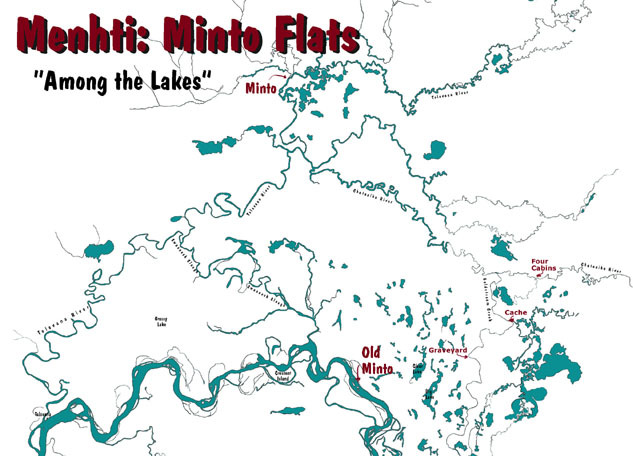 The idea for the Minto Mapping Project originated at the Summer Cultural Camp in Old Minto. The Elders expressed a need for their young people to learn the locations and the importance of several historical places before they were physically unable to show and tell about the sites. They felt this information needed to be handed down to their children and grandchildren so they would understand some of the life-style and historical events from times past, and the role the countryside where they lived, played in their daily lives. The Minto High School students, Elders, and CHEI personel have visited several sites over the past few years and have documented them on the following map and linked web pages. The students interviewed Minto Elders, photographed the area and then compiled their collected information into the pages you will find here. This is an ongoing work, to be added to by Minto students in future years. So please continue to come back and view the students' work! Click on the various sites below to learn more about Menhti: its history and people or begin your tour by visiting the "Welcome to Minto" page. To view artwork of the Minto area created by Minto Junior High school students, click here.